Released 1981 by Atlantic Records. Album Producer: Joe Raposo. LP and cassette. The second Muppet movie soundtrack produced by Joe Raposo added music to some of the most memorable movie productions numbers to date. Raposo's music greatly enhances the whole street singing to "Hey A Movie! ", Piggy tap dancing in the touching "First Time It Happens", and all the Muppets riding bicycles in "Couldn't We Ride." 6. Finale: Hey A Movie! Released 1982 by Warner Brothers Records. Produced by Joe Raposo. LP and cassette. In the early eighties the aerobique movement took off with the success of excercise programs like Richard Simmons. Not to be outdone, Miss Piggy entered the aerobique craze with this album. The song Snackercise was featured on the hour-long 1982 special, "The Fantastic Miss Piggy Show". Released 1983 by RCA Records. Produced by Milton Okun, John Denver and Barney Wyckoff. LP and cassette. This album is based on the 1983 Rocky Mountain Holiday special. Released by I. J. E., Inc. with Muppet Music. Released 1984 by Warner Brothers Records. Produced by Jeff Moss. LP and cassette. "I'm Gonna Always Love You" was also released as the first Muppet music video in which Jim Henson made an appearance wearing sun glasses and very large "flipper feet". The music video was shown on HBO and MTV. Released 1984 by I. J. E., Inc. with Muppet Music. Book written by H. B. Gilmour. Produced for Muppet Music by Geni Sackson. Executive Producer: Jim Henson. Record and 24 page book. This is the official storybook adaptation of "The Muppets Take Manhattan", read by the entire cast with Scooter as the narrator. Released 1984 by I. J. E., Inc with Muppet Music. Produced by Geni Sackson. LP and cassette. This album features funny songs from "The Muppet Show". Even though all of these tracks (except for "I'm My Own Grandpa" and "Memory Lane") were previously released, many of the songs are extended versions not on the original albums. This record is narrated by Kermit and Scooter. Released 1985 by Warner Brothers Records. Produced by Steve Buckingham. LP and cassette. This movie soundtrack is slightly different compared to some of the previous Muppet soundtracks. The goal is to not only highlight the best songs from the film ("The Grouch Anthem" and "One Little Star") but to also tell the story of the movie at the same time. Kermit the Frog is featured during "The Runaway" sequence. This soundtrack won a Grammy Award for "Best Recording for Children". Released 1986 by Playskool. Book and tape set. This book and cassette was designed to be used with the Talk 'N Play unit also made by Playskool. A cassette tape accompanied the book that read the story and directions for each page. 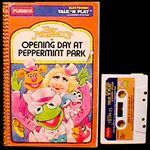 The cassette has voices from the following performers: Jim Henson, Frank Oz, Dave Goelz, Jerry Nelson, and Richard Hunt. Released 1986 by Magic Video Publishing Company with Muppet Music. Creative Director: Geni Sackson. Executive Producer: Jim Henson. LP. In conjunction with the 1986 special, "The Muppets: A Celebration of 30 Years" this greatest hits collection was released. It includes songs from various Muppet shows, specials and movies. This release was also available as a double-record or extended cassette (Volume 1 & 2) from a television only offer on Silver Eagle Records. The double-record volume came with a color poster of Jim Henson from the "Muppets: A Celebration of 30 Years" special. A songbook was also released to correspond with this album. Released 1988 by TeeVee Toons, Inc. LP, cassette, and CD. This collection of TV themes from the 70's & 80's features two Muppet related tracks: "Sesame Street Theme" and "The Muppet Show Theme." The Sesame Street Theme is the same one used on the show during the 1970's. It isn't the original version on the 1970 record. And the Muppet Show Theme is the fifth season version which features an extended verse sung by Statler & Waldorf. "Why do we always come here? I guess we'll never know. It's like a kind of torture to have to watch the show!" This is the only audio release of the fifth season version of the Muppet Show Theme. The CD was later re-issued under the title "Television's Greatest Hits - Volume 3." Released 1988 by Windstar/Allegiance Records. CD and cassette. The long-awaited re-release of the 1979 album on CD. Released 1989 by Longmeadow Press. Lyrics by Louise Gikow and Ellen Weiss. Illustrated by Dennis Hockerman. Executive Producer: Geri Van Rees. Producers: Peter Fish, Louise Gikow, Benjamin Goldstein, and Geri Van Rees. Book/tape set, 24 pages. Kermit the Frog entertains kids on car trips with songs and games. Released 1989 by Longmeadow Press. New music by Louise Gikow. Illustrated by Dennis Hockerman. Executive Producer: Geri van Rees. Producers: Peter Fish, Louise Gikow, Benjamin Goldstein, and Geri van Rees. Book/tape set, 24 pages. Kermit the Frog sings counting songs.